Jasmine’s impromptu birthday bash the day before starting her chemo. We shaved our heads to raise money for a wig made from her own hair. It was touching and traumatic. Everybody gets a terrifying phone call at least once in their life. If you haven’t, you will. I was in shock for days. In fact I still have not cried much. But I wake up in the night. And “Jasmine has leukaemia” runs on an endless loop in my head. And fear grips me. I cannot imagine my world without Jasmine in it. She lives four doors down. She has traveled to women’s events with me. We bake and shop and work and paint and garden and hit playgrounds and do projects together every other day. She’s my mini-me only so much better! So where is God in all this? I think He is trying to send me a message because I hear the same thing everywhere…. First: My pastor/husband Gerry preached from Psalm 91 three days after Jasmine’s diagnosis. The one who lives under the protection of the Most High dwells in the shadow of the Almighty. I will say to the LORD, my refuge and my fortress, my God in whom I trust. “Do you trust Me?” He asked. “I am so afraid!” I replied. Third: I called Air Canada’s Aeroplan this morning to cancel a flight I booked the day before Jasmine got the diagnosis. A soft spoken woman named Zena took my call and asked how she could help. “I booked a flight to Texas on January 16 but the next day we were told that our granddaughter has leuk….sob!” I couldn’t continue. “That’s ok. Take your time. I understand,” Zena said. “Leukaemia” I managed to say between sobs and apologies. I was floored. I told Zena she was the angel God had sent to me today. She added, “I wasn’t supposed to come in to work today, but I did, and you called me…” she paused. God’s Word, a mystery novel, and an angel named Zena — Trust. Believe. Have faith. Choosing to trust God with Jasmine’s future will be a one-yes-at-a-time journey for me. Fear is dogging my tracks but God is showering me with assurances that He is good, that He’s got this, and that I can trust Him. Here I go: My God, in whom I trust! You can follow Jasmine’s Journey here. Posted in focus on faith, minimal moments, need a laugh? Perhaps Hobbits live in northern Greece? This door is waist high. Happy New Year gentle reader! Have you had a chance to look back over the last 12 months and reflect on all that was? Or wasn’t? Nah? Me neither. I’m more of a doer than a contemplator; I seldom take time for deep reflection. Of course, because we all admire what we’re not, I wish I were that type of person so I would have deep insights to share. But I’m not. And I don’t. For the rest of you who are just like me and you don’t set aside time for all that hard thinking, let’s take a mo right now and look back over 2017. How is your health? Go ahead and take your pulse, in case there’s any doubt you survived the dawning of another year. Did you get through the year with all your parts intact? Nothing removed that you think you still need? Or something removed in the nick of time so you can hang around this planet a while longer? I had my first root canal and I truly don’t know why people use that as a measure of how BAD something can be…”I’d rather have a ROOT CANAL than host my relatives for Christmas!” In fact, the specialist who did my root canal hummed through the 20-minute procedure while earning enough to pay off his Porsche! It was fast, painless (except for the wallet), and simple. If your health is good, then 2017 was good to you. How is your relationship with God? Did you move closer to Him or further away? Did you hear from Him…about anything? In my first time through Freedom Session with a group of my peers, I dealt with some issues, made some apologies, came out of denial about a couple things (Yikes! I found out why they call it “denial.” It should be called blindness), and enjoyed the love and acceptance of God in a wonderful way. I am now facilitating another Freedom Session group in my home and dealing with my fear in practical ways. If you moved God-ward too then 2017 was good to you. How is your primary relationship going? In my case, that’s my husband. In yours, it might be a spouse, parent, partner, child, best friend, or…? How are you getting on? Friendly? With kindness? Mutually enjoying time together? Helping each other? Sharing some laughs? Supporting one another through tough times? Committed? Contented? Challenged by the relationship to be the best YOU you can be? If your “first” relationship is still your best then 2017 has been good to you. How is your family? Is everyone still speaking to everyone? Don’t laugh (or cry). You know as well as I do that the people we love the most can become the ones we most resent. A chilling silence can fall over a relationship so quickly it’s shocking. And once you stop talking, neither person wants to be the one to break the silence. This happened to me with one of my beloved family when I allowed resentment to build up and a gulf formed between us. Thankfully, we both made an effort to bridge the gap, make our apologies, and renew the relationship. I have too many friends who come from fractured families where people have stopped talking and they no longer see one another. If your family is intact and people are still attempting to communicate then 2017 has been a good year. And finally, because I am a minimalist, I must ask, how is your junk? I am pretty sure no teen boys read this blog so there won’t be any insane laughter… By junk I mean the stuff that goes into landfills. Do you have more or less junk than last year? if you are in the first half of your life you are still in the accumulative phase; you are still acquiring. Building up your kingdom. Padding your castle. If you are on the downward slope, like moi, you are merging and purging, slashing and burning, tossing and recycling. Just yesterday I hauled 10 boxes, yes TEN, out of my tiny office! All of the magazines, newspapers, scrapbooks, book drafts, speaking notes, completed bible studies and never-to-be-read-again books are now gone! I am going through my junk and asking myself, “Who will have to deal with this once I’m gone and will they appreciate it?” The answer is, my kids, and they will NOT want to read my old journals, look through my scrapbooks, or peruse the first draft and multiple edits of my published books. So I finish with this, if you have less junk than last year, then 2017 was a good year. If you want a deeper reflection on the New Year visit my friend who pastors two small churches in Watrous SK and be blessed. It was that post that inspired me to connect with you today. I pray that 2018 will truly be a good year for you. Focus on the things that matter most — your relationship with God and your besties. Enjoy your health while you have it; nurture your body with real food and moderate exercise. But keep your junk to a minimum! I read your blog this morning on Facebook and had to take a moment to write to you. I love how transparent your are! You are never afraid (oh yes I am! But thanks.) to tell us where you are, I know there was a season where that was not the case, but I love that now you are so open. I too wish that all women in ministry could also be an open book. Ministry can be so discouraging and lonely. It is so easy to hear how things are going in other churches and to then question, why isn’t my church like that? We get so caught up in what we think is success. I have been in that same place (people in ministry keeping the conspiracy of silence concerning their struggles), the place where I so hoped no one saw me. I hoped that my clothing would blend in with the wallpaper and that no one would even know I was there. I wanted to rejoice with my friends over their successes, baptisms, number of members, people growing in their walk with the Lord. I so wanted to be happy but oh I was struggling. I asked God why couldn’t my church be the same? Why couldn’t we be baptizing hundreds of new believers? Or why were we here struggling in this little church plant? Why couldn’t my husband be called to pastor a mega church? All of those things ran through my mind. At times I wanted to get up on a chair and just scream!!! Other times I just wanted to fade away into the woodwork. That time was so dark and lonely. God did carry me through that dark time and has led me to a place where I am happy again. (YES!) I am finding new energy for ministry. I am excited to see what new door God will open this week and I am spending more time in prayer seeking that time with Him. I look forward to seeing my church family and I rejoice with them in their victories! I praise God that He did not let me go, that he led me through the dark time and back into His light! I know I will have other seasons where I feel alone, however, having come through this dark season I know God will be there too. (Okay, here are the first two questions…) I wanted to write to you because in my darkest moments I felt that I could tell no one! I felt that no one could ever understand just how I felt. Reading your book and now your blog reminds me that other’s feel just the same. My question is how do we provide a safe place for them? How do we encourage those who feel lost and alone? I remember attending [a conference for ministry couples] when I was at my very lowest and while it was so good to get away from home, away from those lost and lonely feelings, it was also so very difficult. I did not seem to find the people who might feel just like me. (this makes my heart ache) All I heard was how terrific everyone else was doing. All I heard was how “successful” they were. (And here are the second two questions…) I know now that I was not in a place where I could recognize another person’s pain. I had built up too many walls and could not see over them. So how then do I help others who are there? What can we do to provide that safe place? What can we do to allow for transparency without any judgement? I wish I had the answer. (And yet, you do have the answer, or at least part of it, right here…) I guess what I am saying is that we need to continue to be sensitive to those who are struggling. If I could help another church planter’s wife or pastor’s wife through a lonely season then all of my struggles would be so worth it! How would you answer these 4 questions? How do we provide a safe place for them (spiritual wanderers)? How do we encourage those who feel lost and alone? How then do I help others who are there (in spiritual wilderness)? What can we do to allow for transparency without any judgement? Help me out with your feedback here or on Facebook. Answer one or more from your experience or wisdom and watch for future blogs with your answers compiled. Come out with your hands up! None of us like to surrender. The very word suggests defeat. We want to win, not give in! However, in God’s paradoxical economy, what we see as “winning” might be “losing” in the long run. Spiritual winning only comes through the gateway of surrender. This is one of the valuable lessons learned in the wilderness of spiritual dryness. The wilderness wanderer has to admit that she has lost her way, then to further admit that the most probable reason for it is because she stopped following God and followed her own heart, her own mind, her whims, her best laid plans…. Surrendered thinking is the opposite of wilderness thinking. Trust is essential to surrender. Choosing to believe that God loves you is the first step in learning to trust Him. “Surrender is hard work. In our case, it is intense warfare against our self-centered nature,” writes Rick Warren. He adds “surrendering is never a one-time event. …There is a moment of surrender, and there is the practice of surrender, which is moment-by-moment and lifelong….It will often mean doing the opposite of what you feel like doing.” As we surrender, by choice, over and over, we change the way we think. The night Tammy told me her husband’s shallow, spiteful comment, my thoughts immediately flew to another couple I know. A couple whose marriage, now more than 25 years old, stands as a beautiful example of undying love. The story of Kyle and Cheryl is really the story of Kevin and Caroline. Caroline was my little sister. [Kevin] joined [Caroline’s] father in business in their hometown and they bought a house next door to Caroline’s parents. They took to married life like it was second nature. Caroline worked [at the bank] and kept up with her old friends. Kevin played ball and hockey with the men’s teams. Together they camped and fished, went to movies and ate Chinese food at their favorite café. One year later, in the middle of the night, their future changed forever when Caroline had a grand mal seizure. The tests began and the diagnosis came in. Caroline had a brain tumor. It was inoperable. The specialist told Kevin that Caroline had between two and five years to live. But he added, “I have one patient with a tumor like Caroline’s. She’s still here. It’s been 20 years.” Kevin grasped that hope like a straw and held it. The doctors recommended surgery, then radiation and chemotherapy, as much as she could stand. Twice, Caroline’s hair fell out and returned. The first time it came back curly. The second time, it came back wispy and thin. Caroline was taking so many drugs to control her ongoing seizures that Kevin had to keep track of them for her. It was all so confusing and very frightening. The years began to roll by. Caroline stayed home and Kevin arranged his work schedule so he was home for lunch every day. Caroline always made his lunch – a tuna sandwich – by herself. It took her 30 minutes. After they ate, they played a hand or two of Rummy before Kevin went back to work. He made supper when he got home around five. They ate together, watched their favorite television shows and went to bed early. And the years passed. Eventually, Kevin stopped playing sports and fishing as it got harder and harder for Caroline to leave the house. He taught her how to use the computer and she spent many happy hours playing Solitaire and other simple games. He built her a tray on which to do puzzles and she did hundreds of them. Kevin did all the shopping, even for his wife’s clothes. Years later it was discovered that Caroline’s cancer was completely gone. However the residual scar tissue in her brain required continued seizure-control drugs. These drugs changed her physically, emotionally, and behaviorally. She became forgetful and repeated herself. She had a hard time understanding plots in movies and books. She seldom cried but sometimes laughed inappropriately. She forgot the names of her nieces and nephews. And everything she did was at a snail’s pace. After 23 years, Kevin had to put Caroline in the local nursing home when she fell and broke her hip. It was an excruciating decision. She did not want to go but he could no longer care for her at home. He felt like a traitor but he had no choice. The drugs had swollen her body to twice its normal size and she needed the help of mechanical lifts and professional caregivers. Over the next few months Caroline almost slipped away. Kevin thought he was losing her; he was despondent. She could not speak or move, was fed by tubes, and barely recognized him or her family. Every spare minute he had, Kevin was at her side. Slowly she began to rally as her new home became more familiar. A year later, she was up and around in a wheelchair, joking with the nurses and teasing the staff. She became the classic “teacher’s pet” of the nursing home. Kevin no longer had to spoon-feed her so they ate all their meals together in the dining hall with the other residents. After they ate, Kevin pushed Caroline back to her room or to the common room if she had visitors. Seldom sitting, Kevin hovered near her chair. He would brush her wispy hair, gently caress her arms and every few minutes, kiss her somewhere on her face. Always laughing at her silly comments – some the result of drug-induced confusion, some truly funny quips – Kevin brought sunshine into her world. Careful always to guard her dignity, he answered her every question, no matter how often repeated or how simplistic, with kind clarity and a smile. Caroline knows she is loved. And she is grateful. Kevin is one of my heroes. He is the best example I know “with skin on” of God’s undying love. Caroline isn’t the girl he married if you compare photos. But she’s every bit the person he fell in love with on the inside. And he has never once forsaken his promise to love and to cherish, in sickness and in health. As God promised the Children of Israel, and us, the children of the new covenant, through His prophet Jeremiah: I have loved you with an everlasting love; therefore, I have continued to extend faithful love to you (Jeremiah 31:3). Caroline took her last breath almost two years ago, held by Kevin and Chelene (their miracle child, now grown and married with two children of her own). She was loved with an undying love. True love not only looks different, it sees us differently than we see ourselves. Jesus promises us He will love and cherish us, in good times and bad, in sickness and in health, and not just “until death us do part” but beyond the grave. Caroline is being held and caressed in the arms of Jesus now. Kevin did a good job of preparing her. If you have drifted away from God, lost touch with God, feel abandoned by God, are disappointed in God, or just royally ticked off at God please think about this love story. It is both true (factual) and real (possible) and it is a beautiful picture of God’s true love, His undying love, for you. Posted in focus on faith, need a laugh? When I was expecting my first baby, the doctor wanted to find out if I was ready so he asked me what I thought about natural childbirth. I didn’t know what he meant. I mean, wasn’t childbirth natural? What was unnatural childbirth–a big slimy alien bursting out of your chest? He suggested I research the Lamaze Method and come back in a month. This baby has just been born, she is brand new just minutes old. She looks like she jsut stepped out of heaven. My mother had delivered eight babies. Did I ask her advice? Absolutely not! I had been to college! And I had a library card–the Internet of yore. I read the Lamaze book in one sitting: piece of cake! I can do this on the kitchen table, mop up and have the girlfriends for brunch. At the second prenatal visit I told Doc I was ready and I would not be needing any pharmaceutical intervention. At all. Keep the tylenol in the cupboard; I will do this the natural way. He asked me if I wanted Gerry in the delivery room. My friend Laura had said: If he’s there to put in the order…he ought to be there to pick up the package. Yes I do, I said. In order for Gerry to get clearance he had to view the film, Having Our Baby. Medical professionals used this as a filter for queasy dads; if you survived the film, you were in. I wasn’t too sure about Gerry–oldest of five boys. No sisters. I decided to go along in case he needed a hand to hold. Two weeks before our due date, we arrived matinee ready with two little sacs of homemade popcorn. By this time I was large and uncomfortable, needing help to rise from low couches. I lumbered in and we sat on the two straight-backed wooden chairs in a room smaller than most kitchens. The screen wobbled on its flimsy tripod; we had front row seats. The lights were doused and the reel began to chatter and whirl. Larger-than-life characters were right in our face. I opened my popcorn and began to nibble, smugly wondering how Gerry would react when things got dicey. I peeked sideways. Gerry was also nibbling, showing no signs of discomfort. Yet. I’d better keep my eye on him. The film’s star was obviously a Swede – buxom, blonde, cheerful and uninhibited. She arrived at the hospital with her little suitcase in one hand, her little husband in the other. Every few hours, we would revisit the Swede to see how she was progressing. Thanks to film editing, this only took minutes, giving the impression that labor is a quick, painless affair. Hah! Just like the book, I thought, and I stole another glance at Gerry. Nibbling. Calm. As soon as the Swede was in the stirrups, the camera zoomed in on the action. I had never seen so much…action! I couldn’t swallow my popcorn; I felt hot and dizzy. I looked at Gerry. He seemed nervous, like he wasn’t sure if he was supposed to be looking at her…action. He fidgeted. He peeked. He ducked. He nibbled popcorn. He peeked again, looked my way, shrugged and gave me a wan smile. The Swede began to push. I felt queasier. Suddenly, without any warning whatsoever, the doctor asked the nurse for a needle. There were definitely NO needles in the Lamaze book! A close up shot revealed a device the size of a javelin. He plunged it in deep. I gasped. The doctor asked for scissors. He made the judicious cut the Lamaze book failed to mention. The lights went out all over the world. At 38 weeks, I was great with child. He tried anyway. When I came out of my swoon I wanted to talk to my mother. I wasn’t as ready as I thought I was. This true story illustrates the danger of a little knowledge. It is so easy to read one book, watch one doc, view one DIY YouTube, take one class, talk to one self-proclaimed expert and prematurely assume you are ready. Chances are, you’re not ready. I wasn’t as ready as I thought I was to have that baby. But guess what? Two weeks later, the baby came anyway! Life has a way of doing that–of moving forward, ready or not. The inevitable truth is that none of us lives forever, on this earth. I am in the decade neither of my parents completed. They died at 66 and 69 and I am 61. I don’t know what tomorrow brings but I do know that whether I survive this decade or not I am assured of rent-free accommodation with Jesus when I shuffle off this mortal coil. That fact was settled November 19, 1973 when I said no to being my own god and Yes to Jesus as God. I accepted His forgiveness, thanked Him for paying my debt, and stepped in to my eternal future, ready or not. But I didn’t stop there. Walking by faith is a lifelong learning process. My 43-year-old faith has raced ahead, stumbled and fallen, gotten trampled and lost in the dessert, evolved and simplified, deepened and matured and I’m still learning. Riveting. Comforting. Full of “Aha Me Too!” moments. Humorous. Clever. Incredibly well written. So Canadian you can almost smell maple syrup between the pages. I loved it! 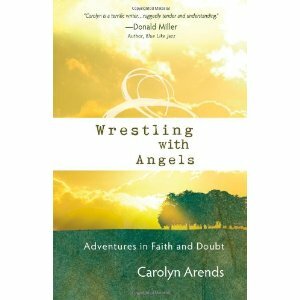 Carolyn Arends’ book Wrestling with Angels: Adventures in Faith and Doubt displays a wisdom way beyond her years (written when she was 30-something) and a well-read background not often found in one so young. Arends’ honest recounting of her paralyzing spiritual doubt that began at a high point in her successful musical career grabbed my attention because of my own long journey through spiritual wilderness that began at about the same age. However, she seemed to negotiate it with far more assurance than I did and one of the reasons may be that she recognized something that I failed to see for far too long: the Mystery of God. Once I entered a little way into the Mystery of God, there was no going back. I could no longer list all the things I did not understand about God as threats to my faith–instead they became the primary evidence that God was, in fact, God…and that I was, in fact, not. I could endure the tension, sometimes experienced as doubt, and believe anyway. And here was the most radical part: I could believe not only in spite of but also in some ways because of my unanswered questions. I discovered a new way of breathing…and believing. What this young singer/songwriter taught me through her book was that instead of allowing doubt to destroy her faith, she understood that doubt defined her faith, even deepened her faith. What is faith after all? I know what it is not; it is not fact. In order for faith to be faith, there must be an element of the impossible, the unthinkable, the unprovable, the mysterious. That is why my husband/pastor Gerry always told me during my decade of debilitating doubt, “Connie, you haven’t lost your faith, you’re finding it.” And so I was. The faith I “found” has fuzzier boundaries and duller colours than the faith I started my Christian life with. Don’t assume that I am loosey-goosey-anything-goes in my beliefs. Far from it. The Bible is more true to me than ever before but I no longer have to understand everything in it. When I encounter the unexplainable I don’t get stuck there, I declare “I guess this is Mystery” and move on. If you want to read Carolyn Arends’ latest blogs start with this one. I appreciate her transparency and integrity as she deals with the question of whether or not going to church is the best thing for today’s believer.